3herosoft CD Ripper - Rip music CD to audio formats, CD to MP3/WMA/AAC. CD Ripper, rip CD to audio and backup CD track to MP3/WMA. If you want to upload CD songs onto Internet and share them with your cyber friends or extract some music tracks from CD for other edition, 3herosoft CD Ripper will be worthy of considering for you managing CD tracks. It can help you rip audios from CD and convert CD tracks to MP3, AAC, AC3, AU, FLAC, M4A, MP2, OGG, WAV and WMA on your computer for backup. 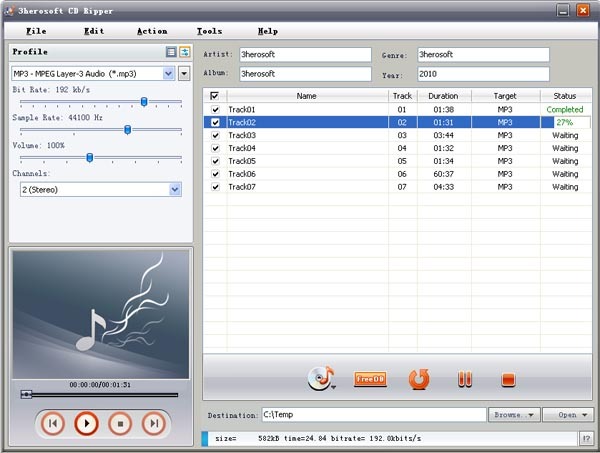 The CD Ripper also provides powerful features for audio-editing before ripping: you can customize any audio profiles from CD with several parameters settings, such as Audio Bit Rate, Sample Rate, Volume, Codec; And also allow you to edit ID3 tag, select any CD tracks to convert at your will and retrieve CD info from the remote CDDB and download these info for the ripping files. Additionally, 3herosoft CD Ripper provides you with various encoders and built-in player for audition. Meanwhile, you can enjoy CD music files on your computer or upload these CD tracks onto Internet. And it offers simple operation and high CD ripping quality. Don't hesitate, purchase this useful product with your savings, and then you can get a big surprise for managing your Music CD conveniently! How to rip CD tracks to MP3/WMA/AAC on your computer?